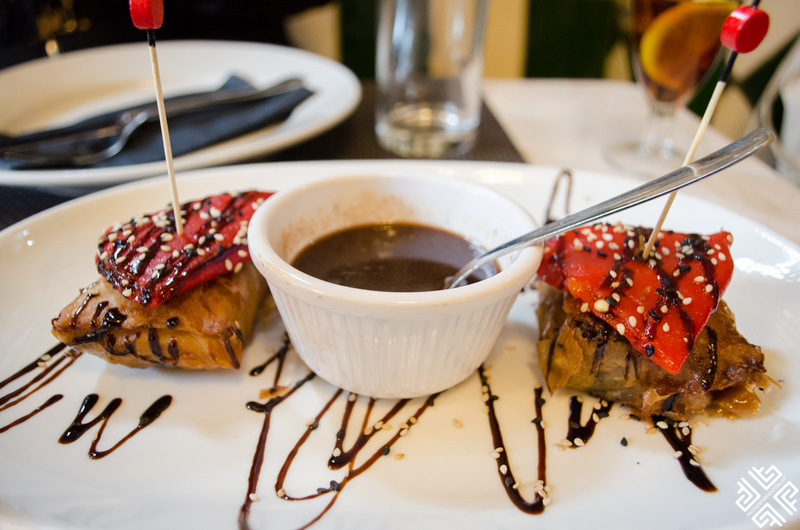 Spain is well known for its tapas culture with every region having its own versions and specialties. One of my favourite activities when exploring a new city always involves a closer introduction to the food culture. 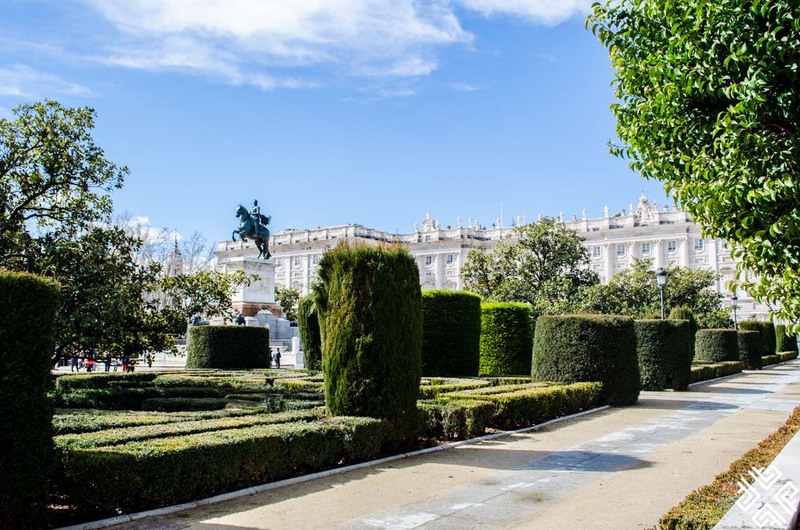 During my recent city break in Madrid I joined Devour Madrid on discovering the best of Spanish Cuisine. 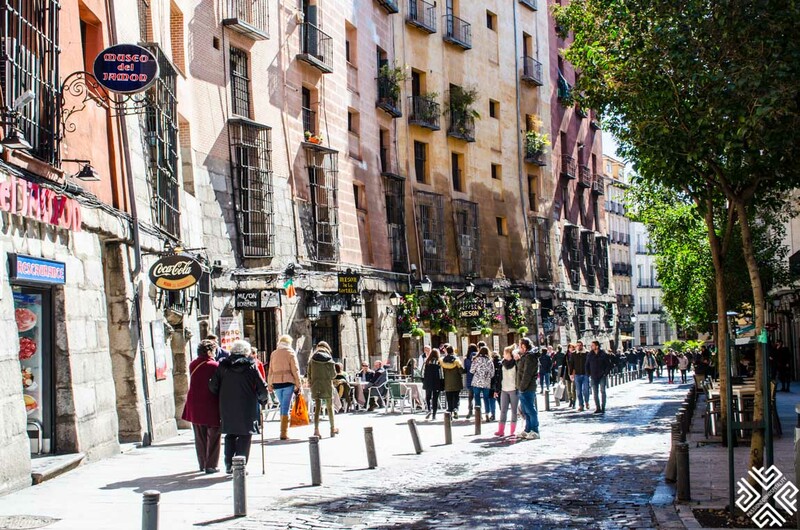 Tapas may be a cultural activity yet there is much more to Spanish Cuisine and this is what we learned during our Sunday food tour with Devour Madrid. 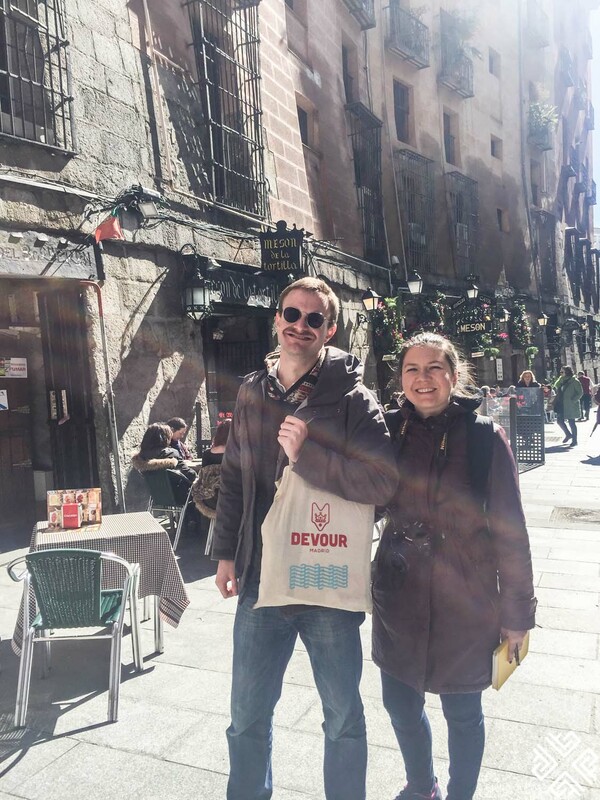 Devour Madrid is a local Spanish owned company which was started by a small group of passionate food lovers with the goal of supporting smaller family-run businesses by bringing the money back into the local economy. 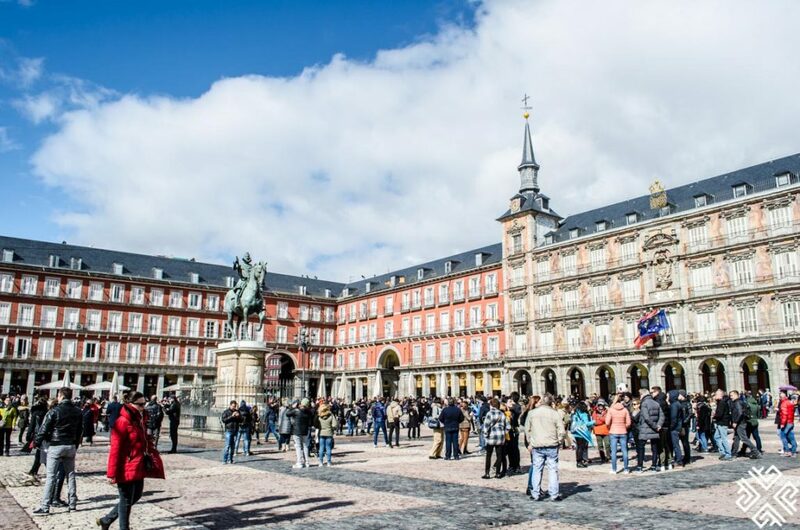 We met with our guide Ewan at the Plaza Mayor, the central square of Madrid which is over 400 years old. 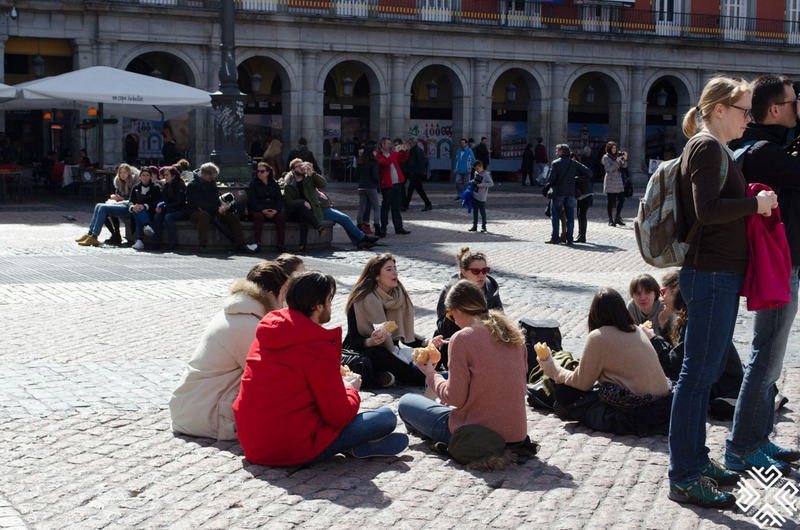 Lined with numerous cafes and restaurants it is one of the liveliest squares in Madrid. As Ewan explained in the early 1500s Madrid had a population of about 3,000 people, however soon afterwards when it became the capital of Spain in 1561 — its population grew rapidly as people started moving here from all corners of the country. 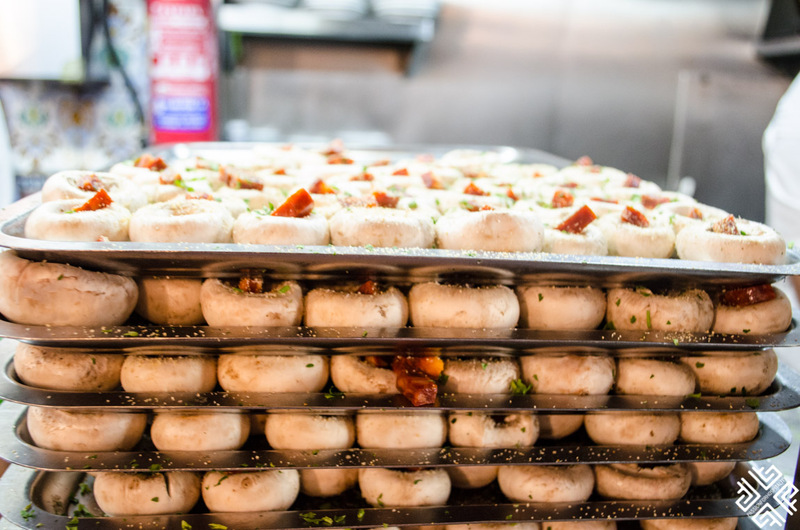 This was the turning point of the city’s diverse cuisine. 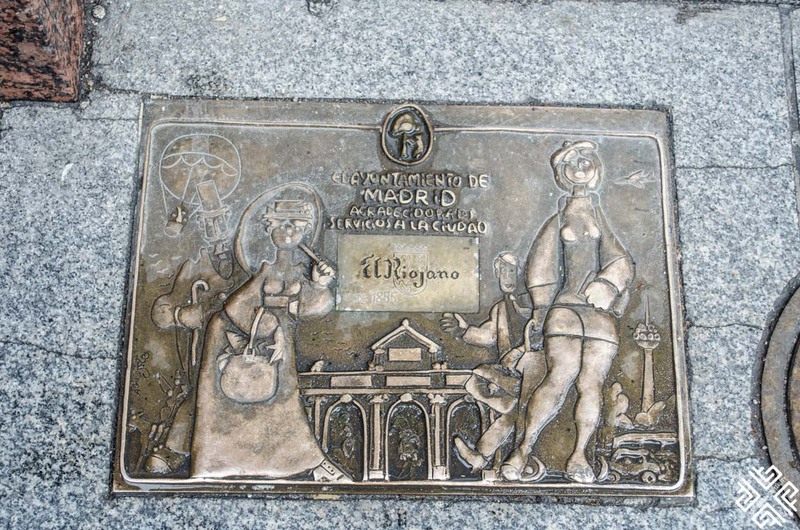 The people of Madrid are often referred to as gatos which translates as cats — and this is a nickname given to the natives whose both parents and grandparents come from Madrid. Due to the high rate of immigration to the capital from other cities of Spain, the real gatos have become scarce. 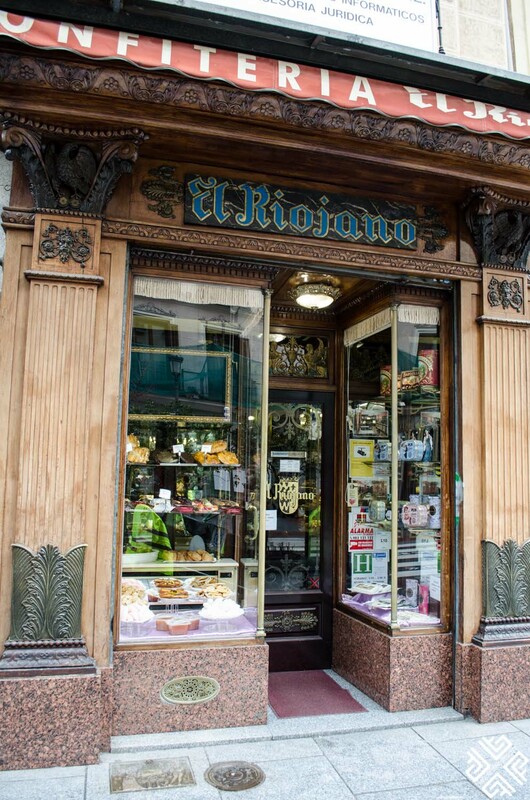 One of Madrid’s oldest bakeries the El Riojano was founded in 1855 by Dámaso de la Maza who used to work as the private chef for Queen Elizabeth II. 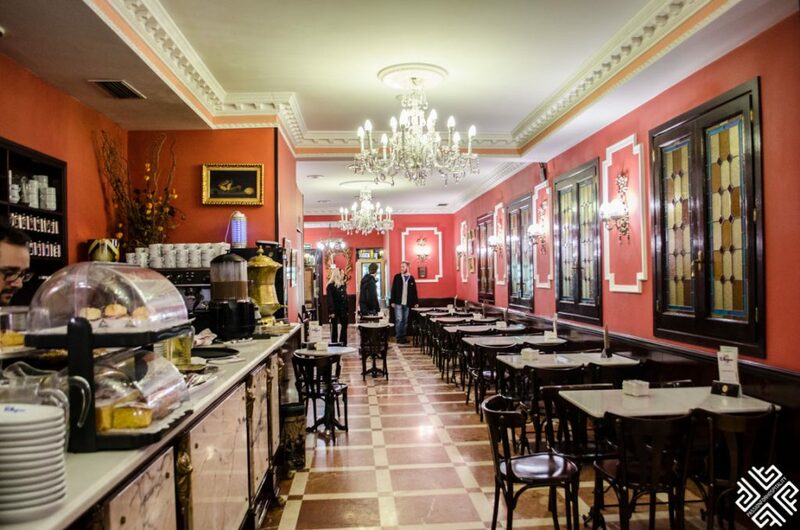 The exterior of the place looks small but as you enter inside you will find yourself in a beautifully decorated cafe which is well known for its traditionally baked cakes. 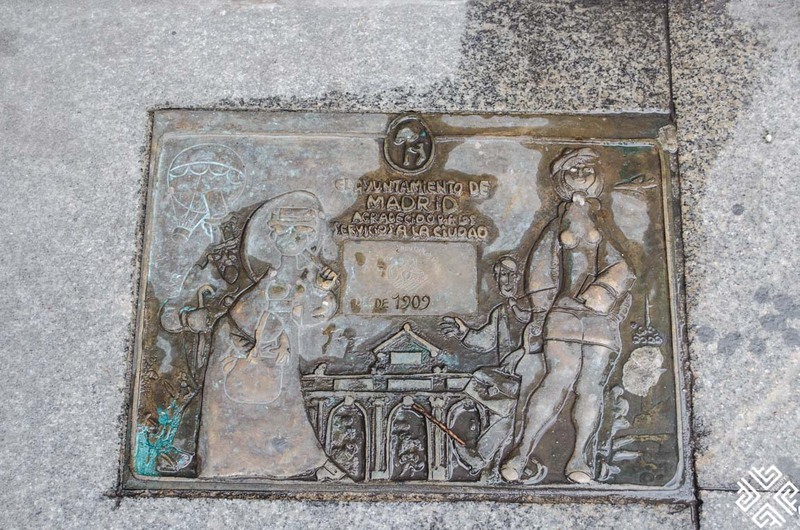 One of the unique things about the historical local businesses is that you will find a special plaque on the ground which is awarded to the local businesses which have been there for over one hundred years. 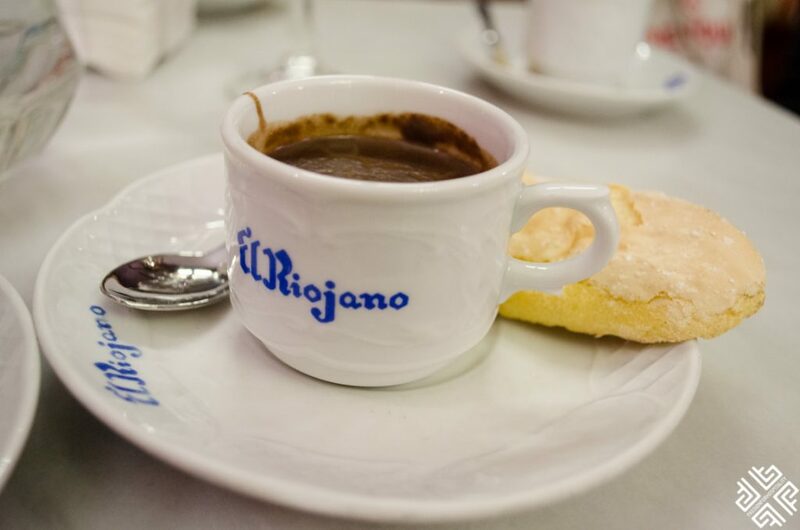 Our first stop was at El Riojano for a mid morning break which is a soletia (biscuit) dipped into hot chocolate. It is a slightly different version of the Churros con chocolate which is a crispy cinnamon stick which is also served with hot chocolate. 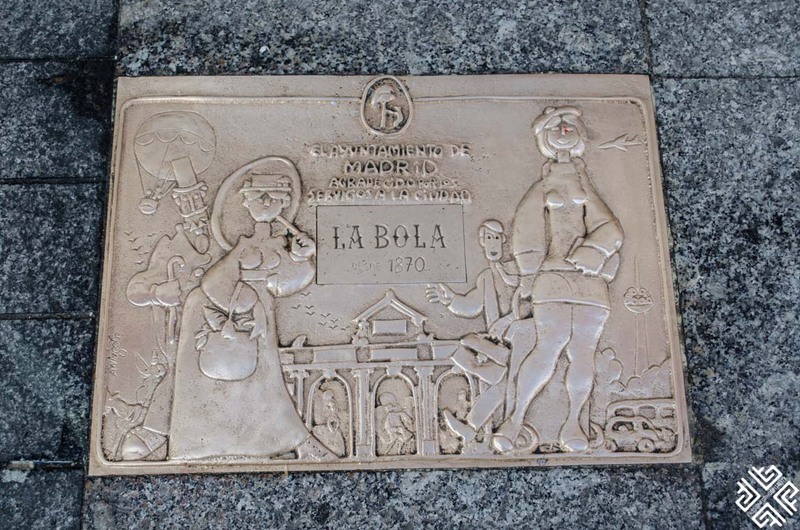 As Ewan explained when Columbus went to America he tried chocolate which was not to his taste as it was spicy — later when it was imported into Europe, chocolate was turned into a sweet version. 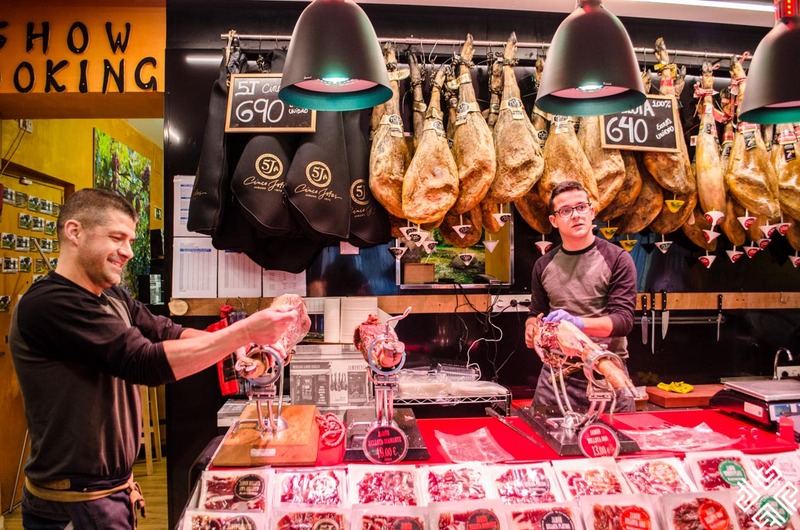 Our next stop was at a family-run jamoneria which is managed by two brothers Luis Miguel and Andres. 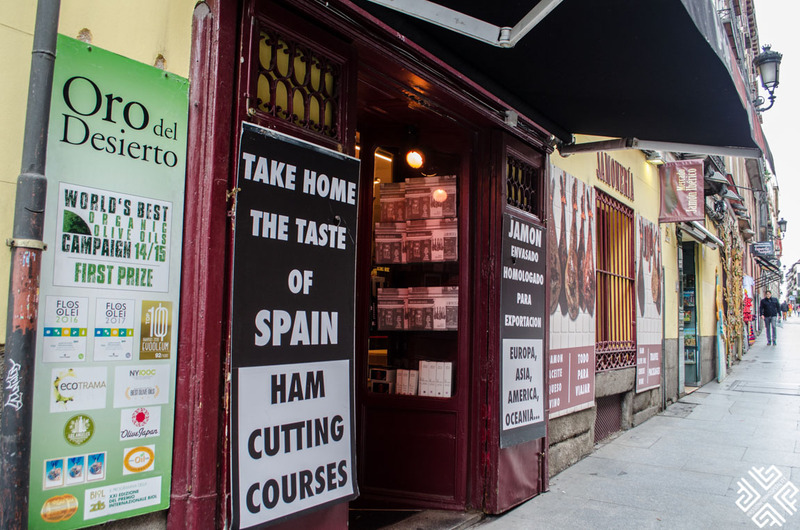 Here is this small, cozy shop you can also master the technique of hand-slicing jamon or simply enjoy a tasting of hams and wines. 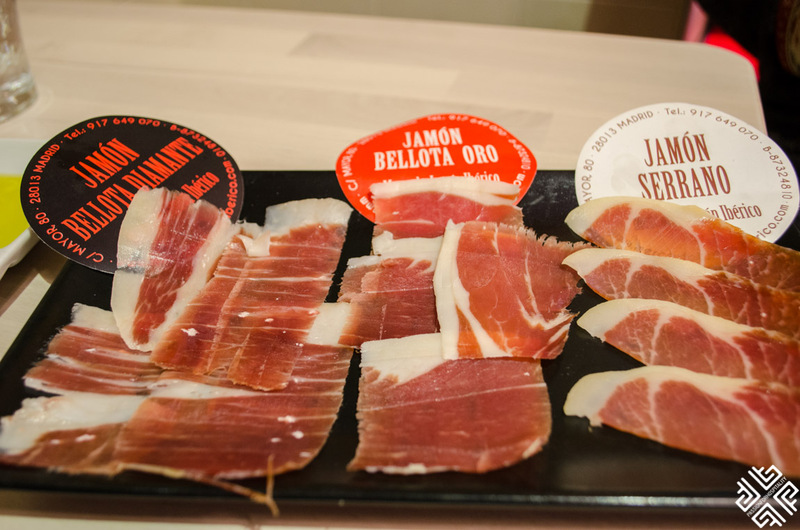 We tried three different varieties of jamon. 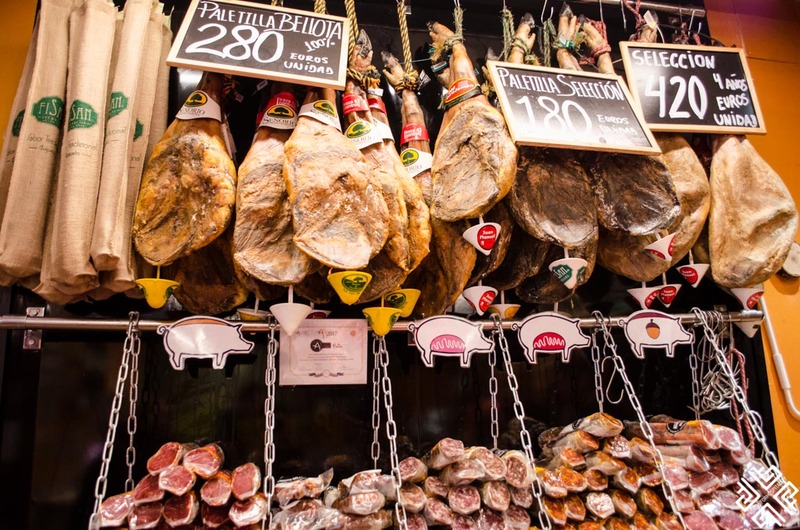 The Jamon Serrano, which is characterised by the pigs white feet and is cured for a period of 12-15 months. The Jamon Bellota Oro which is made out of the Iberian black pig and cured for 4-5 years. The preparation usually involves the leg of the pig being packed in salt for the curing period. It was traditionally cured in the mountains. The third variety which we tried was the Jamon Bellota Diamante. Bellota translates as acorns — in fact the pigs are fed acorns and as a result they produce nut fat which is good for cholesterol. This type of jamon literally melts in your mouth, it has a very subtle taste and nutty flavour. 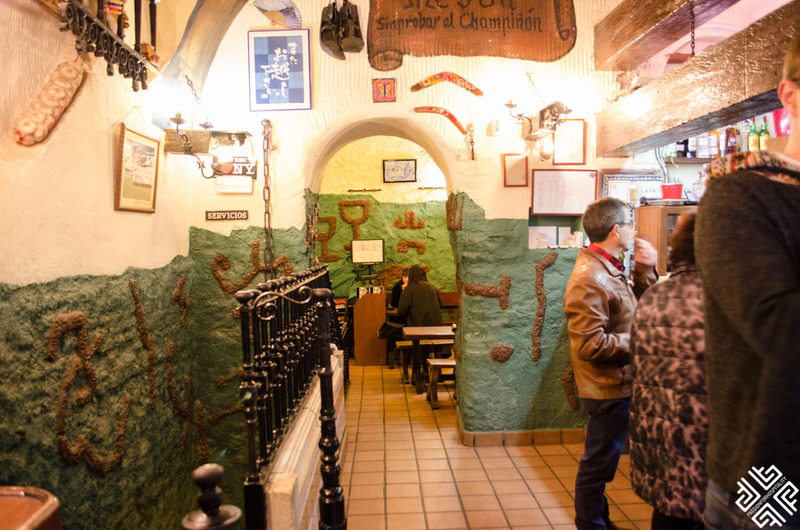 The third stop of our food tour was at the El Anciano rey de los vino, another local business which has been around for over one hundred years. 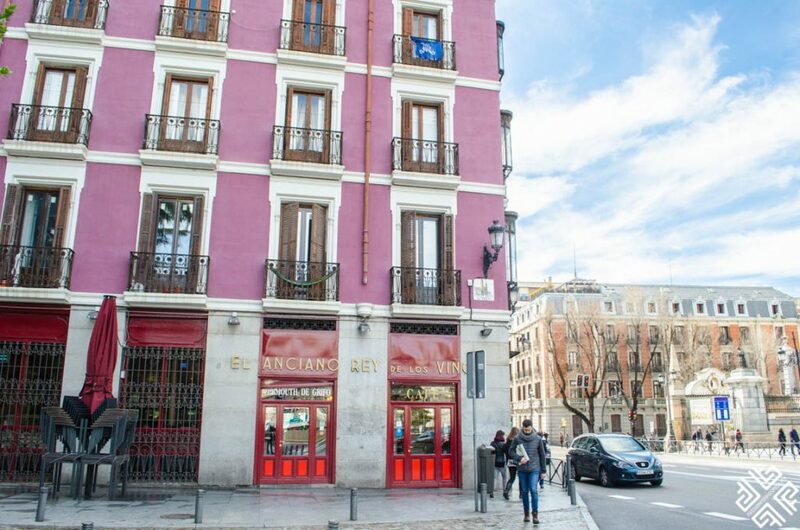 Located on the ground floor of a colourful building just across from the Almudena Cathedral and steps from the Royal Palace of Madrid. 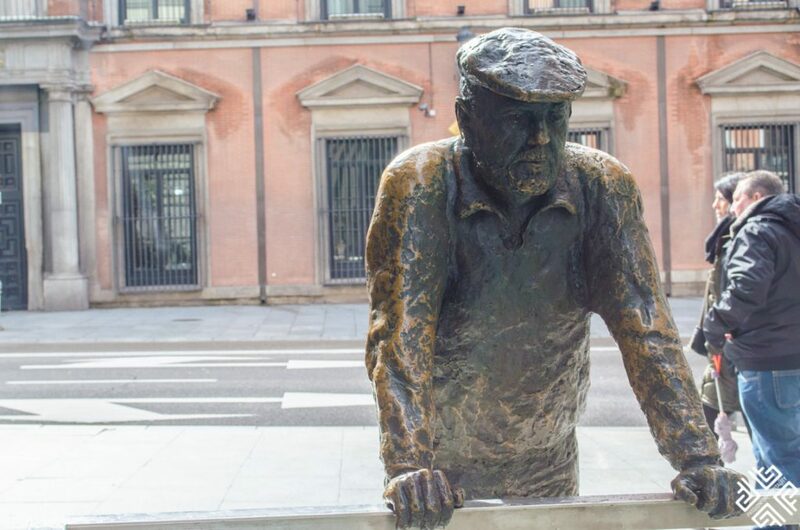 In 1948 a gentleman by the name Constantino moved to Madrid from Avila seeking work in this place, where over the years he worked his way up and eventually bought out the place. 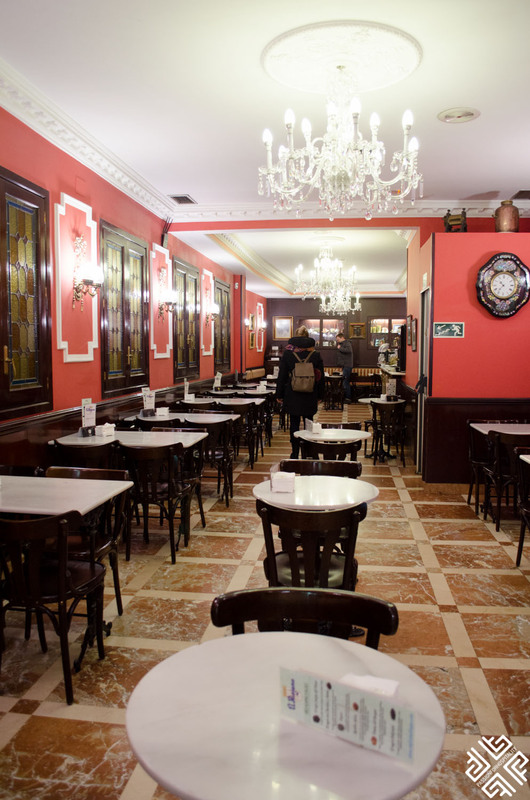 Today the restaurant is owned by his daughter Belen. 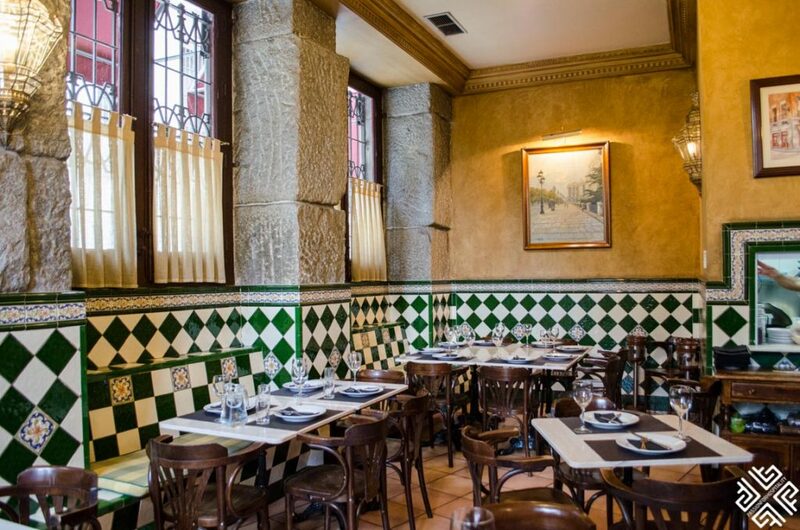 The restaurant has an indoor bar area and a separate restaurant area decorated with exquisite green tiled walls. 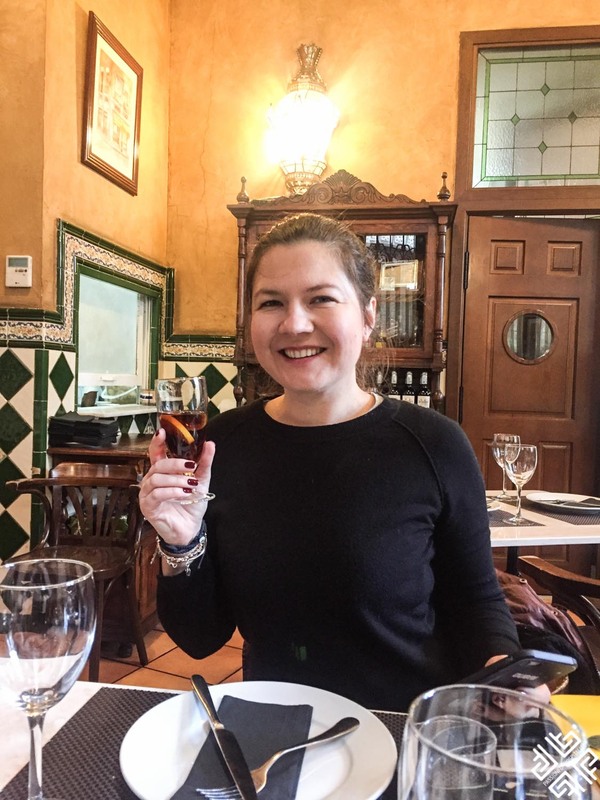 Here we tried their signature dish which was created for the occasion of their 100 year anniversary which is the Regalito de Rabo de Toro — ox tail cooked for hours in balsamic sauce until tender, wrapped in phyllo pastry with sweet red pepper. We paired the dish with a glass of Spanish Vermouth which is a fortified wine flavored with various botanicals. 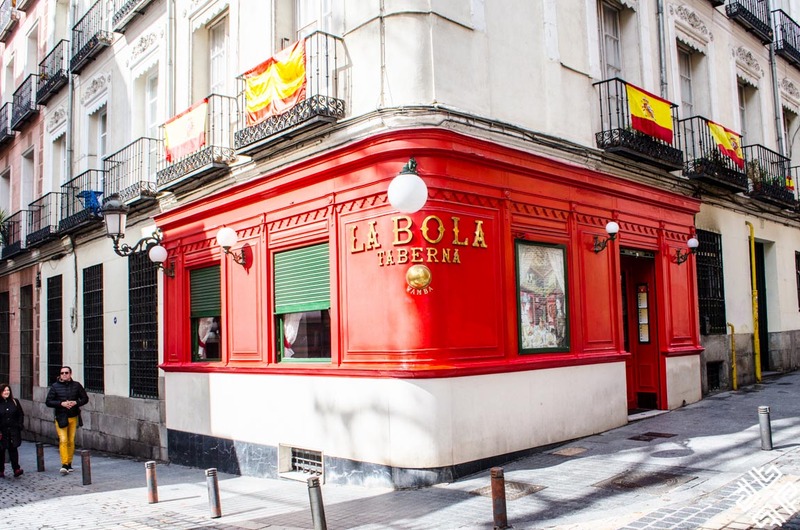 Just a few steps away from the Royal Palace of Madrid situated on the corner of a quiet neighbourhood is a place known as the La Bola Taberna, a famous restaurant which has been around since 1870 — serving the traditional specialty cocido madrileño. 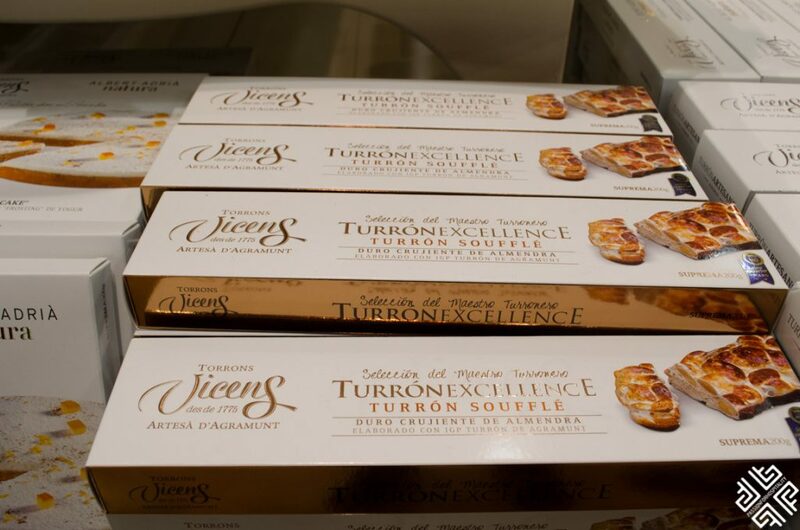 The place was founded by a lady from Asturias, matriarch of Los Verdasco family dynasty — the same family which manages the business until this day. 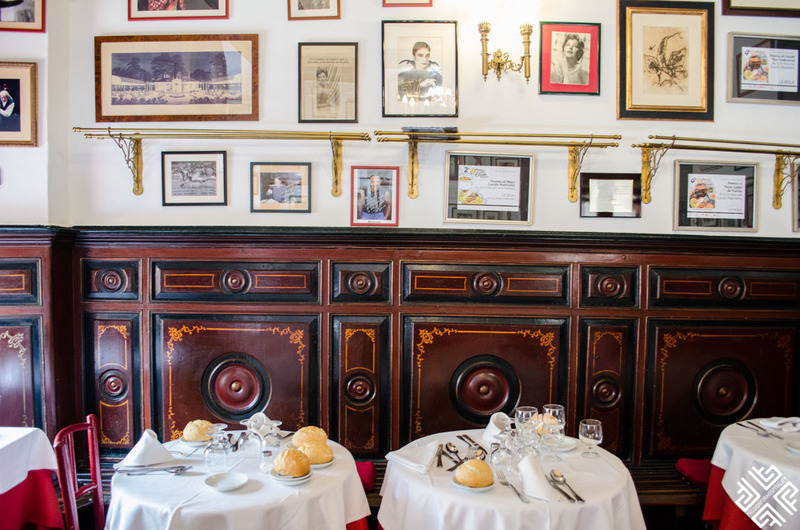 We arrived here before noon and the restaurant was already set-up for Sunday lunch — a popular pastime for the locals, when they get together with friends and family to enjoy a long meal. 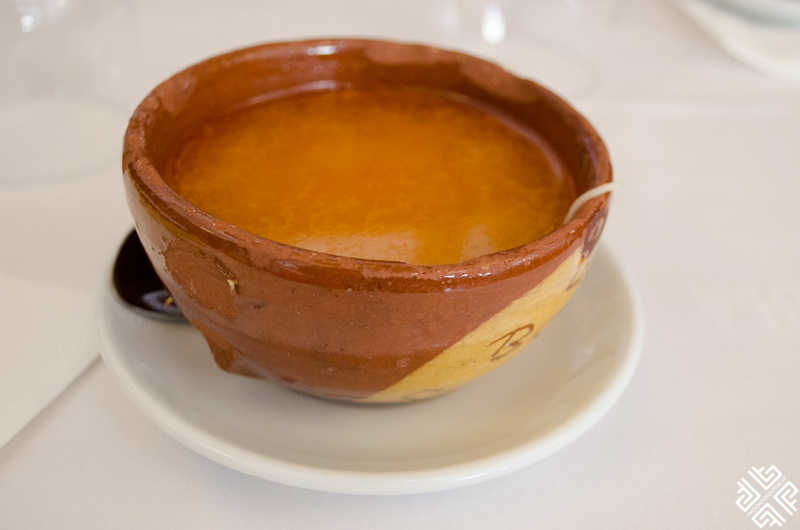 The specialty of the restaurant is a Madrid stew which is prepared using a traditional cooking technique on oak charcoal at a low heat. 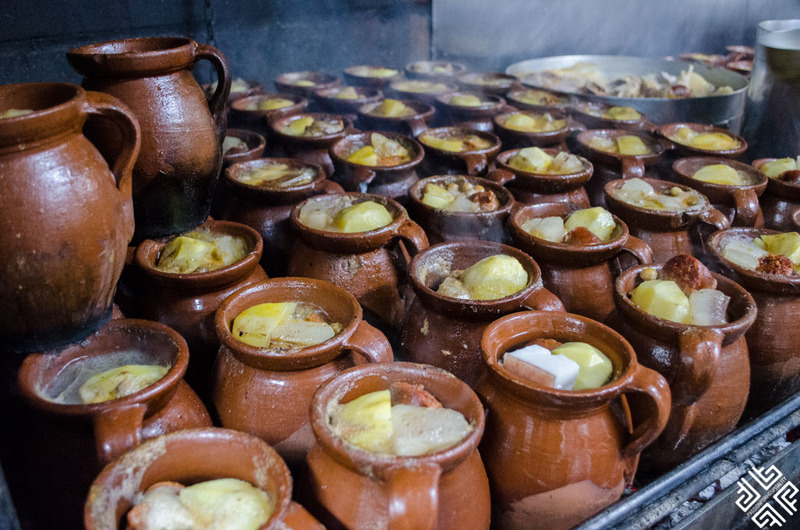 The ingredients (meat, bacon, chickpeas, potato) are placed in clay pots and cooked for hours — water is continuously added to the pots. We only had the one part of the cocido madrileño which is the bouillon with pasta and is apparently a great remedy for hangovers. The full course costs about 20 Euros. Reservations at this restaurant are highly recommended as it gets extremely busy during its peak operating hours. We had the privilege of entering the kitchen to witness the whole cooking process. 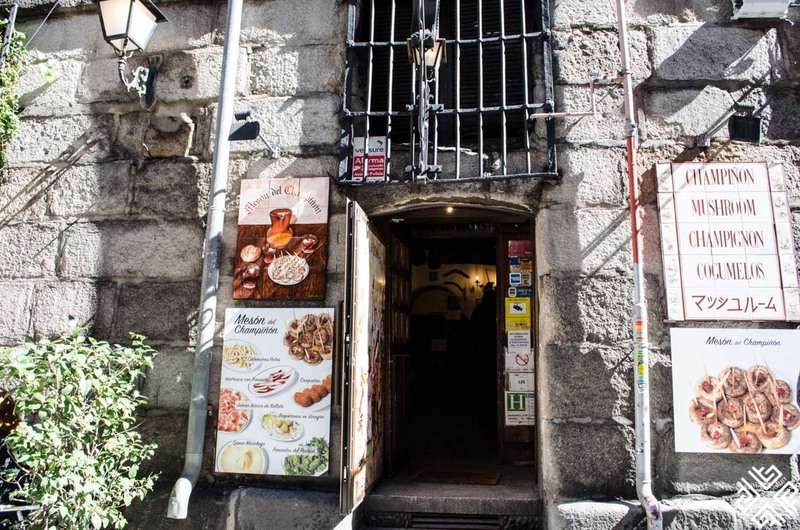 We then returned back to the heart of Madrid just off the side street from the Plaza Mayor there is a place lined with small restaurants serving various tapas. 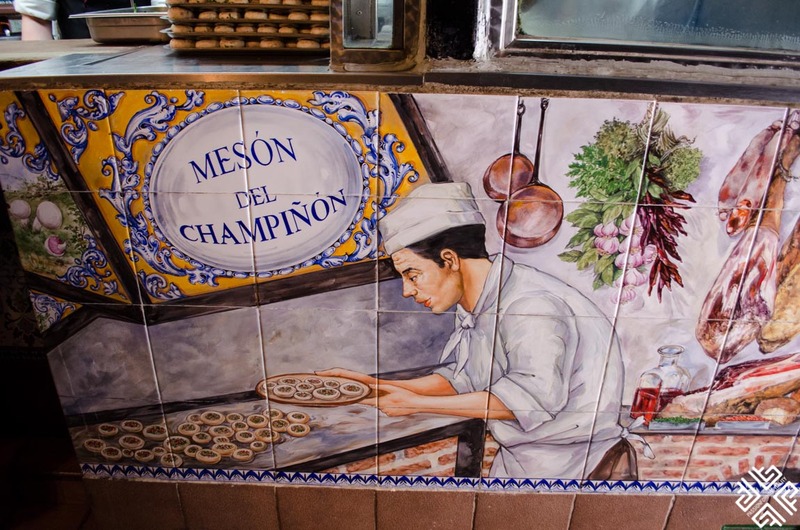 Our next stop was at the Meson del Champinon — the house of mushrooms. 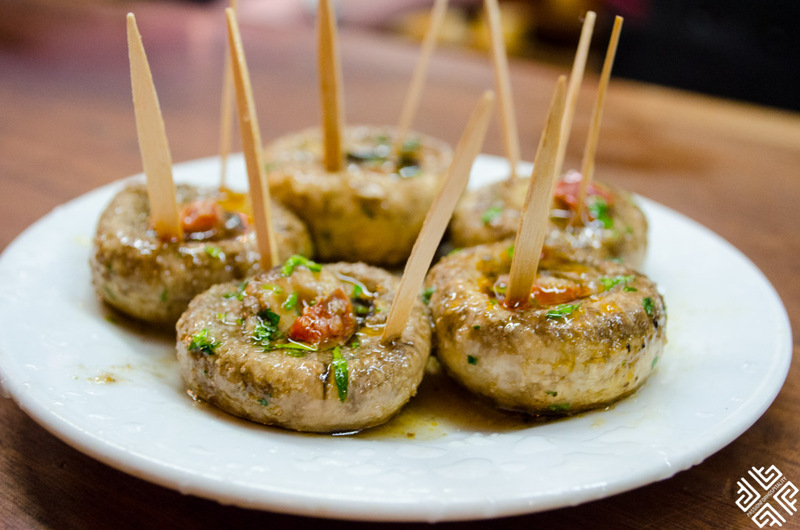 The place specialises in mushroom tapas which are stuffed with a piece of chorizo and sprinkled with plenty of lemon juice. 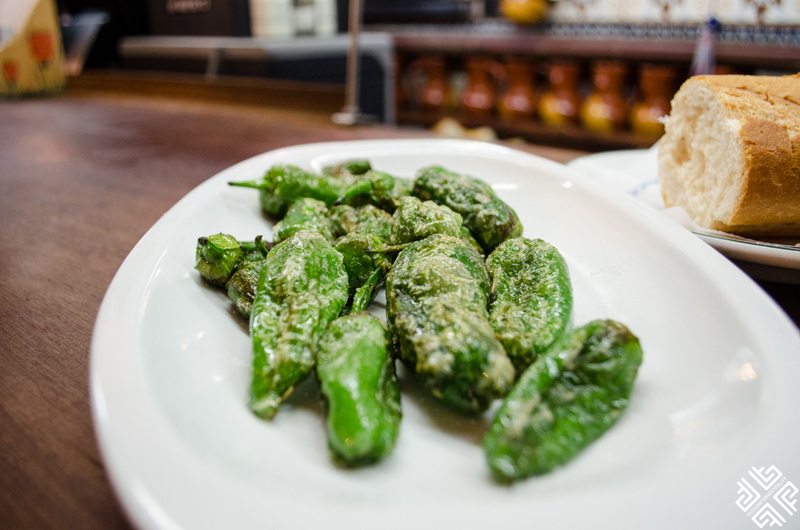 We also tried the pimientos de padron which are small charred green peppers. We paired the mushroom tapas with a glass of Tinto de Verano which is a popular Spanish drink, very similar to sangria — usually made from wine and sprite. 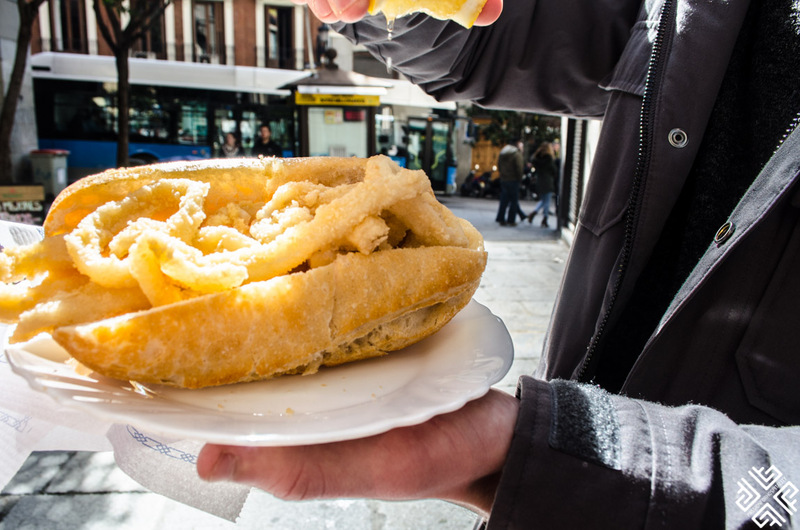 One of the famous street foods of Madrid is the calamari sandwich. 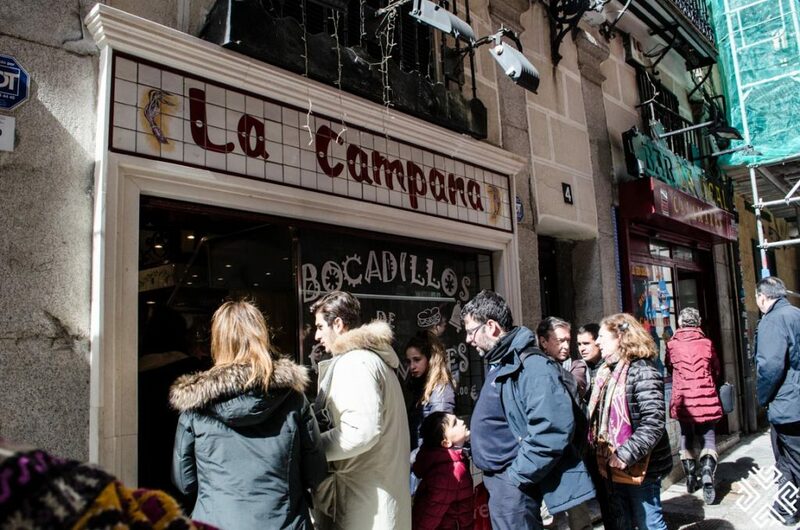 La Campana is located on the side street of Plaza Mayor and you will definitely find a queue here. The sandwich is made of a fresh baguette with fried calamari rings which is best enjoyed with freshly squeezed lemon juice. The final stop of our Ultimate Spanish Cuisine Tour with Devour Madrid was at a sweet shop which is famous for the traditional nougats and other specialties. 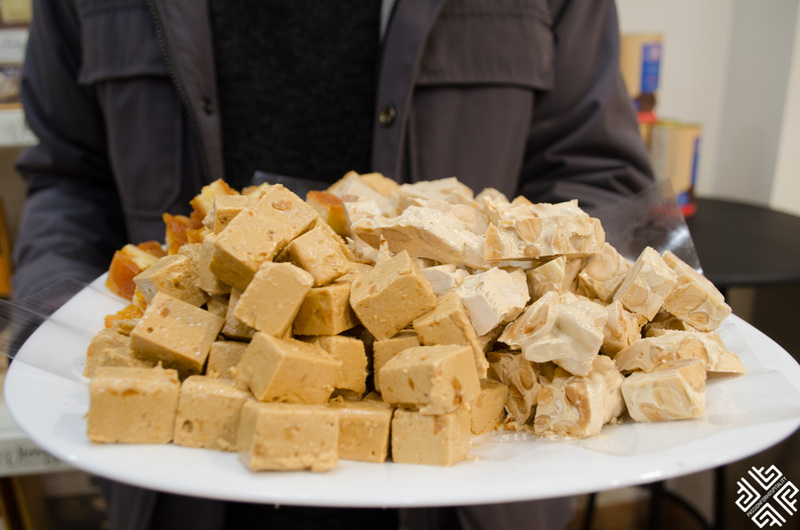 We tried a few of their favours — the Turrons Duro which is a traditional sweet usually enjoyed during the Christmas holidays and made out of almonds, honey, sugar and egg white. 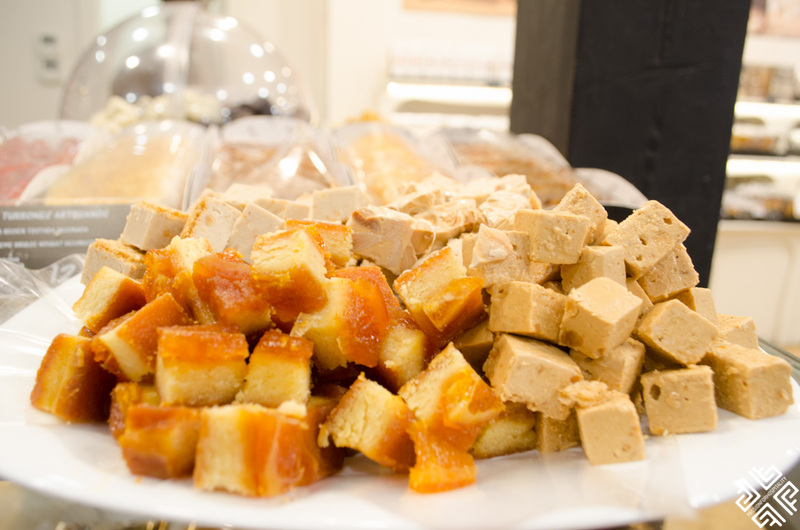 The Blando which is softer and more like a halva, the Yema Quemada which is has a caramel colour and made from burned egg custard. 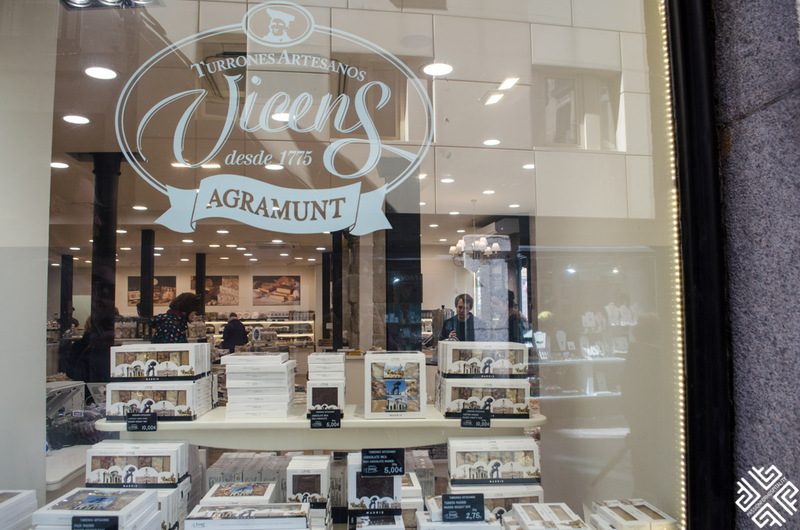 The Turrón Historia Cremoso de Almendras is one of their excellence range nougats. 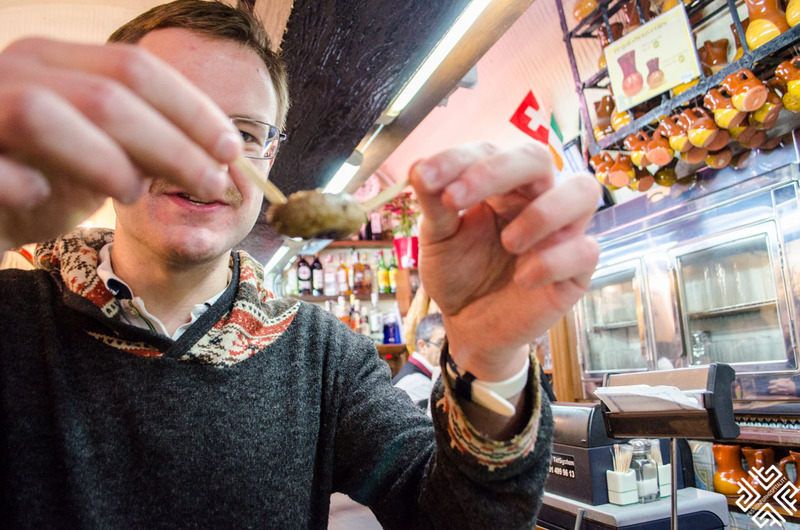 We had a wonderful day with Ewan discovering the best of Spanish Cuisine, who had great knowledge of Madrid’s culture, he also shared many insights about the city and recommended places to go and enjoy a great variety of tapas. 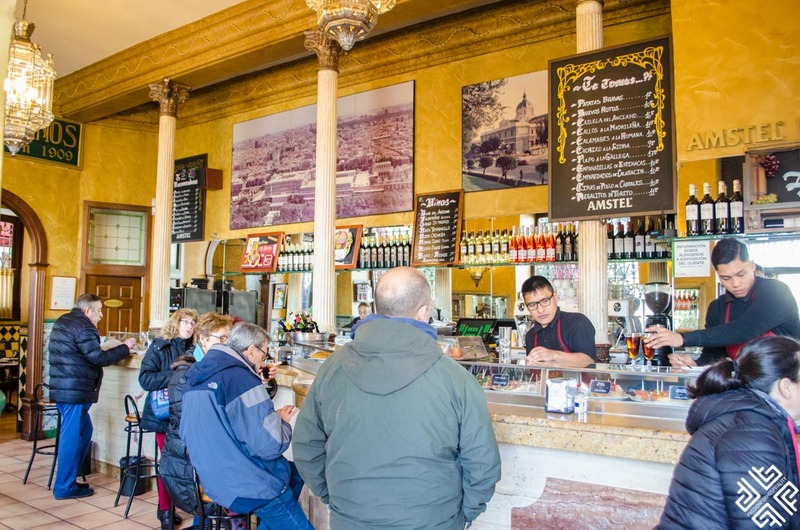 Have you been on a food tour of Madrid or any other city? Let us know in the comments below. 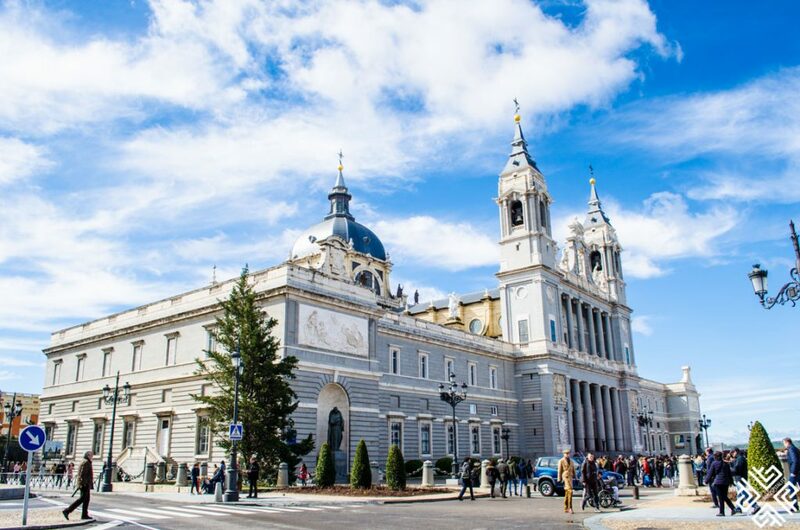 Check out this post on how to spend the weekend in Madrid.